Report of Acting Rear-Admiral Lee, U. S. Navy, transmitting a report regarding the placing and trial of torpedoes for defense against the C. S. ram Albemarle. Farrar’s Island, June 12, 1864. 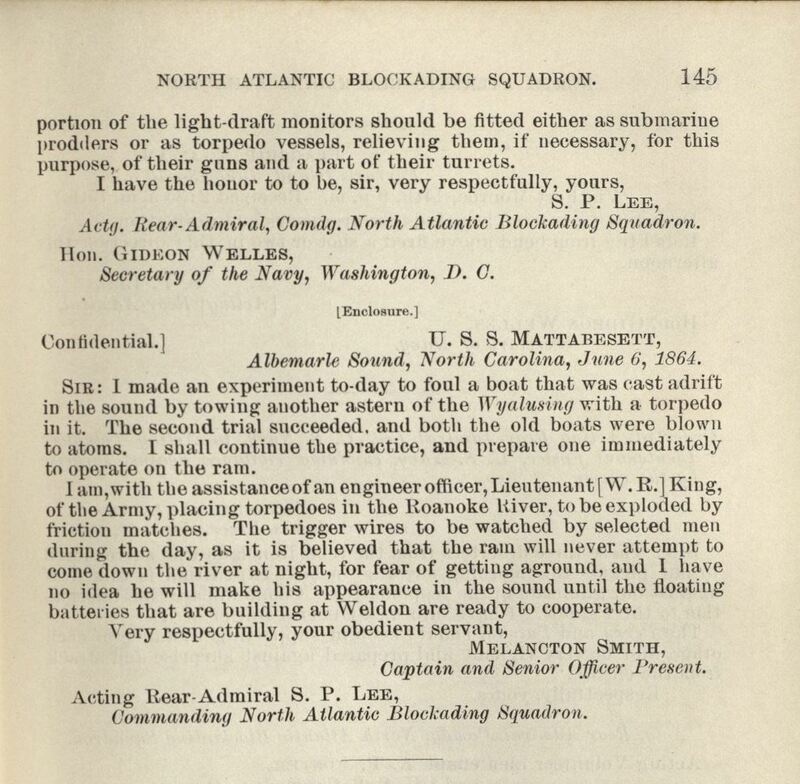 SIR: I enclose a communication from Captain M. Smith, dated 6th instant, reporting experiments with torpedoes, and referring to the probable movements of the Albemarle, and I ask the attention of the Department to Captain Smith’s remark as to floating batteries building on the Roanoke. If not inconsistent with the views of the Department, I would respectfully suggest that it may be beneficial to the public service if a portion of the light-draft monitors should be fitted either as submarine prodders or as torpedo vessels, relieving them, if necessary, for this purpose, of their guns and a part of their turrets. Actg. Rear-Admiral, Comdg. North Atlantic Blockading Squadron. Secretary of the Navy, Washington, D. C..
Albemarle Sound, North Carolina, June 6, 1864. SIR: I made an experiment to-day to foul a boat that was cast adrift in the sound by towing another astern of the Wyalusing with a torpedo in it. The second trial succeeded. and both the old boats were blown to atoms. I shall continue the practice, and prepare one immediately to operate on the ram. I am, with the assistance of an engineer officer, Lieutenant [W. R.] King, of the Army, placing torpedoes in the Roanoke River, to be exploded by friction matches. The trigger wires to be watched by selected men during the day, as it is believed that the rain will never attempt to come down the river at night, for fear of getting aground, and I have no idea he will make his appearance in the sound until the floating batteries that are building at Weldon are ready to cooperate. Captain and Senior Officer Present. Item citation: Official records of the Union and Confederate Navies in the War of the Rebellion.. Series I, Volume 10. Washington : G.P.O., 1900. C970.75 U58no Ser. I, Vol. 10. North Carolina Collection, Wilson Library, University of North Carolina at Chapel Hill. This entry was posted in North Carolina Collection and tagged Albemarle Sound, batteries, Confederate Navy, CSS Albemarle, Gideon Welles, Melancton Smith, naval, naval operations, reports, Roanoke River, S.P. Lee, submarines, torpedo, United States Navy. Bookmark the permalink.